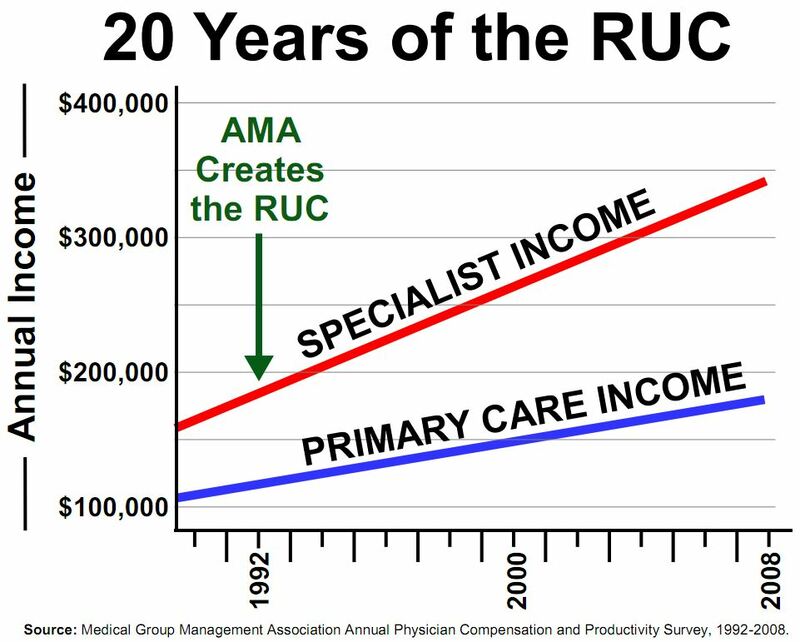 Why Primary Care Parity Matters | Replace the RUC! After an exciting and challenging day of caring for patients and teaching students, a third-year medical student on his family medicine rotation says to me, “I really like what you do, but I just cannot afford to go into family practice.” I realized that by “afford,” he was referring not only to finances but also to the expectations of his parents, friends, and medical school. After spending 35 wonderful years as a family doctor, I have been “dissed’ by a kid who wants to become a dermatologist. So I am of two minds. Part of me is fulfilled by being needed, loved, and respected by my patients. Over time, they have increasingly looked to me to diagnosis, advise, reassure, and guide them through a complex healthcare environment in which few others offer them help. Another part of me sees that what I do is increasingly devalued by forces outside the exam room ― those who pay for health care, those who question the “medical necessity” of each test I order or drug I prescribe, and those in medicine who are more likely to know a procedure’s CPT code than a patient’s name. We are in this position because we have failed to define ourselves, instead allowing others to perpetuate myths about what we do. The first such myth is that what we do is easy. Nothing can be further from the truth. In about 15 minutes, we are asked to treat a long list of chronic problems (e.g., diabetes, obesity, hypertension), resolve a few new problems (eg cough, headache), address preventative health recommendations (eg, smoking, flu shot), integrate the psychosocial issues that impact the patient’s health, and figure out how to get it all paid for by an insurance company using codes that don’t really match either my patient’s problems or the care I provide. Oh, and by the way, can you look at this rash and fill this prescription for my husband? Recent research has shown that an average primary care visit is 50% more complex than a visit to a cardiologist and five times more complex than one to a psychiatrist. So no, it is not easy. 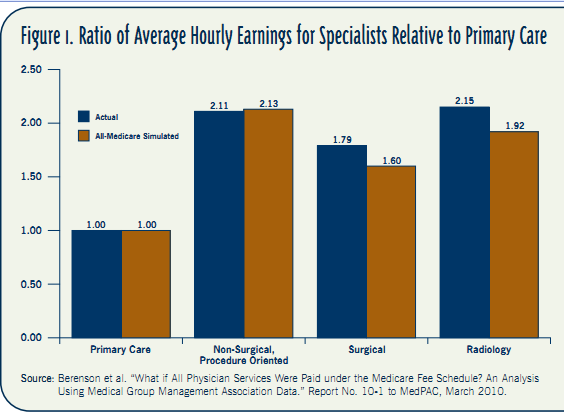 The second myth is that it requires less training than other medical specialties. This has resulted in some assuming that primary care can be left to “midlevel” clinicians. While physician assistants and nurse practitioners can work effectively in primary care settings, it is a mistake to believe that they provide equivalent care to patients with complex problems, and we have suffered by the wide acceptance of this assumption. OR techs can work effectively in an operating room, but no one suggests that they replace surgeons. A third myth is that all we diagnose is colds. Patients present with a vast sea of undifferentiated complaints. Most of these are diagnosed in primary care. After all, most patients’ cancers are diagnosed before the patient gets to the oncologist, and someone has already figured out that the problem is renal before a visit to the nephrologist. 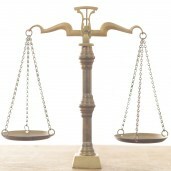 For a cardiologist, the biggest diagnostic dilemma is really whether the patient has or does not have coronary disease. There are, in fact, few medical specialties other than primary care where the doctor doesn’t know the disease before opening the door to meet the patient. And many common complaints are complex. Consider for example, “I’m tired all the time.” Does the patient need a TSH, a cardiac echo, an SSRI, or a little time and reassurance? Sorting all this out is beyond the talents of the endocrinologist, cardiologist, or psychiatrist. It requires a good family doctor. A final myth is that we function as “gatekeepers.” The image here is that the good stuff is behind the gate and family physicians are barriers blocking patients’ access to it. This obnoxious concept was perpetrated by managed care organizations, which did a great deal to misrepresent the value we bring to healthcare. My goal is to match the right patient with the right treatment at the right time. In this day of unnecessary heart caths and back surgeries, patients need someone they can trust to have their best interest at heart. These myths and others have resulted in devaluing the image of primary care at a time when it is needed most. Thirty million Americans will be added to the insurance rolls by 2014 and state Medicaid budgets will go broke. It did not have to be so bad, but my student became a dermatologist instead. Paul Fischer is a family physician at the Center for Primary Care in Augusta.